This article, written by Lilya Kas'yanova and Penelope Price, was first published in the September 2014 edition of Embellish - the Australian magazine for textile arts. Kyrgyzstan is a small, Central Asian republic, almost entirely mountainous, lying within the Tian Shan mountain range. The Kyrgyz were traditionally nomads, travelling each year with their herds of cattle, sheep and horses from high mountain pastures to the lowland winter pastures. Although collectivised in Soviet times, traditions remain strong in this remote and beautiful country, often called the Switzerland of Central Asia. 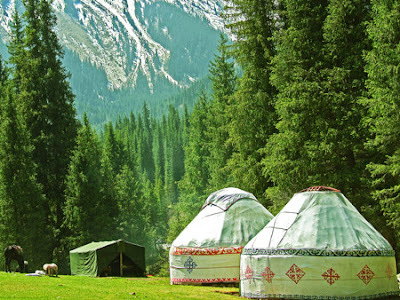 The yurt, made from an expanding wooden circular frame covered in felt, was the traditional Kyrgyz dwelling and even today many rural families assemble yurts in their backyards or in the mountains, and pass the summer there. 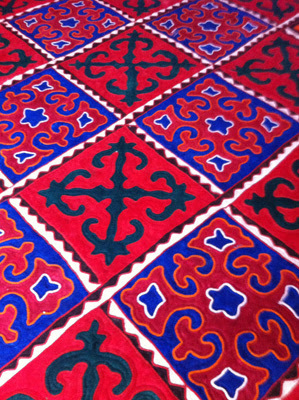 Kyrgyz yurts are highly decorated: the tent bands, furnishings and felt carpets, made by women, were key indicators of the position and status of the owner. Felted items have always been symbols of family, handed down from mother to daughter. In the wake of the Soviet disintegration in 1991, Kyrgyzstan was hit hard: the economy went into free fall, unemployment climbed exponentially and families struggled to meet ends. Enterprising rural women, with the assistance of development agencies such as Switzerland’s Helvetas, learned how to sell their felted carpets, to produce different felted items for international markets (often incorporating contemporary designs) and to value the glorious heritage of their craft. 3. nano felting, a type of wet felting, which makes it possible to fuse felt with other fabrics such as silk. Originally, felted items were produced in natural combinations of white, black, brown and grey. Plant extracts were also used for colours; however, this has gradually given way to synthetic dyes. Kyrgyz like strong, bold combinations, though there has recently been a resurgence in natural colours to meet tourists’ preferences. birds in flight design convey the wish that your dreams come true. The Altyn Kol Women's Cooperative in Kochkor have assembled an informative sheet of the meanings of Kyrgyz carpet symbols. 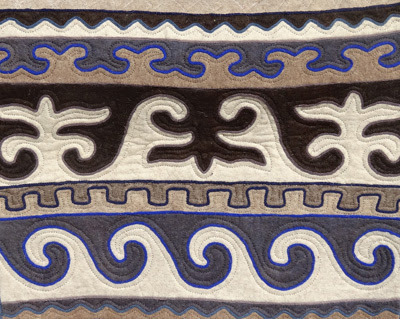 The next installment of this post will focus on the steps in creating a Kyrgyz carpet.